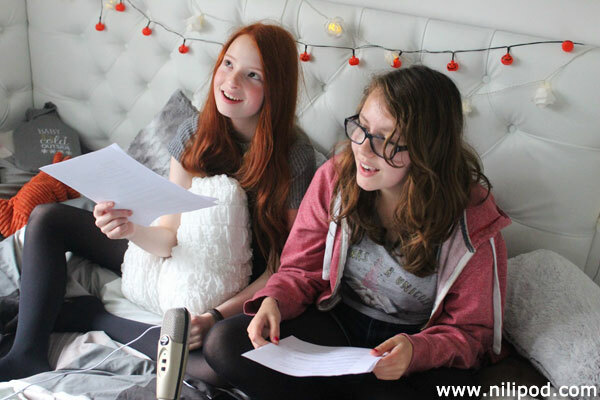 Here we are in the bedroom podcast studio, reading our scripts and speaking into the microphone. We spend many hours each week preparing for our podcasts, researching the topics and features on the Internet, and making copious amounts of notes. Although we have a script for some parts of the show, such as the stories on the Good News feature and the hilarious YouTube comments that we read out, we generally just like to talk and chat. We use the notes to prompt us, to make sure that we don't forget what we were supposed to be talking about. It is very easy to get distracted and end up forgetting what we were doing without some kind of notes. We write these using MS Word on the computer and then print them out (one copy each) so that they are nice and neat, and easy to follow. It is red for Nia, and black for Liv.